The Safety Centre have a range of dedicated power supply units ideal for use with Briton 996 Overhead Door Closers. These power supplies are 24V dc versions which can also be used with fire alarm system equipment to allow the door to be held open during normal day to day operations and then allow the Briton 996 unit to close the door upon operation of the fire alarm system. For more information on Briton 996 Power Supply Units call us NOW on 01200 428 410. We have a selection of different sized power supplies available which are suitable for use with the Briton 996 Door Closer range. This range includes the C-Tec BF377 Power Supply Unit. 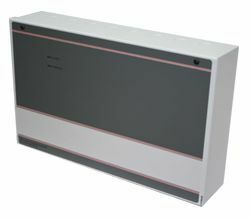 This power supply is a 24V dc 2A power supply which is suitable for connecting several Briton 996 door closers to. It features a set of contacts which can be easily interfaced into a fire alarm system. We also have available the C-Tec BF375P which is again a dedicated 24V dc door magnet power supply. This device has a 250mA output and comes supplied on a neat double gang plate. If you’re interested in Briton 996 Power Supply units you may also be interested in our Briton 996 and Geze TS4000E door closers.